This video by Yoshimitsu Inamura shows 12 instances stacked to create a 12 voice polyphonic Kairatune. Sounds nice! Kairatune 1.2.5 has been released for OS X. This is a maintenance release for OS X Yosemite compatibility. This update is for OS X only. The latest Windows version is 1.2.4. Huge thanks for all feedback, help and bug reports! Every once in a while we receive a request for a printable manual for Kairatune. Kairatune version 1.2.4 has been released. This update fixes all of the known bugs. Thanks to everyone who have contributed their time to help me weed out the bugs and issues. I would like to give some love to Ohm Force for helping with problems i was having with Ohm Studio and to Ableton for their support with Live 9 and to Image Line for their kind support with FL Studio 11 and to Synapse Audio for their support with Orion. Kairatune has been updated to version 1.2.3. Thanks for all who have helped on testing! There’s a new video manual for Kairatune available by Nick Maxwell from Nick’s Ableton Live Tutorials. The preset manager has some features that are only accessible by right-clicking on the preset list. Details option displays a preset detail editor that lets you modify the preset name and category and add other supplemental information to the preset. 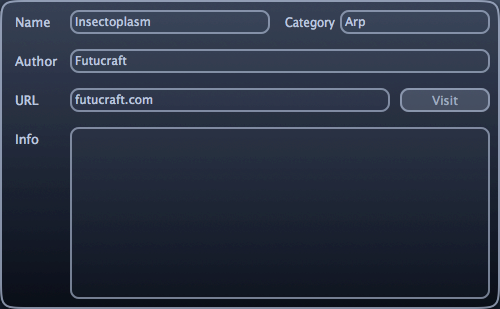 Double clicking on a preset name also displays the detail editor. Copy and Paste options lets you duplicate and copy a preset across instances of Kairatune. The Paste option always appends the set of presets instead of replacing the current preset. New option simply adds a new preset with default parameter values and with the name “Init”. Export option lets you save the preset as a ktpreset file. Remove option simply removes the preset. MIDI assignments sub menu lets you copy, paste or clear the MIDI assignments of the current preset. The button on the upper right corner opens a configuration menu. Through the configuration menu you can load or import presets from various file types and export the current set of presets as a ktbank file. Load option replaces the current set of presets. 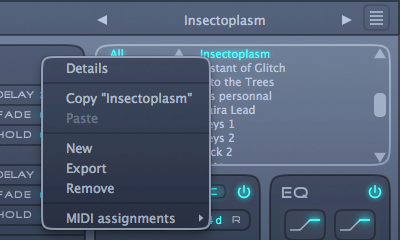 Import option appends the current set of presets. You can import ktpreset single preset files and load or import ktbank preset bank files exported from Kairatune version 1.2. You can import single preset FXP files and load or import FXB preset bank files generated with prior versions of Kairatune. Restore factory presets replaces the current set of presets with the built in presets. Remove all presets option clears the current set of presets. If you want Kairatune to start up with a custom set of presets, you can configure the current set to anything you want and set that as the default. After you’ve set the default, any new Kairatune instances will launch with the new default set of presets. The MIDI learn menu opens by right-clicking on a control. The menu provides options for assigning a MIDI controller to the parameter by learning. In short, MIDI learning means that you instruct Kairatune to listen to MIDI controllers and assign the first controller it receives to control the selected parameter. The three different variations let you assign the control to the specified sub ranges of the parameter’s values. After you’ve assigned a controller you will see a separate sub menu for each assigned controller. The sub menu provides options to further modify the controller range or remove the assignment. Kairatune has been updated to version 1.2.2. This update fixes bugs found on text editing in the preset detail editor and inconsistency in Audio Unit version number that caused Logic to repeatedly validate the AU component. I wish you all happy holidays and good times with music!